Folders are used as a storage mechanism in document management. Folders should be created in such a way that they are easy for users to browse when trying to locate documents. The main goal of using folders is to categorize documents and create a logical structure so that documents can be easily found and retrieved at a later stage. Folders should be similar to the file structured used in an organization to store paper-based documents. •In the tree view panel, select the cabinet under which you want to create your new folder. •Right click on destination cabinet/folder from the tree view or list view panel to get the popup menu. Click on New Folder. oNormal: This option will allow you to create folder and at your convenient assign security, profile, Audit Trail and other settings from Properties. settings. For more information, see Template. 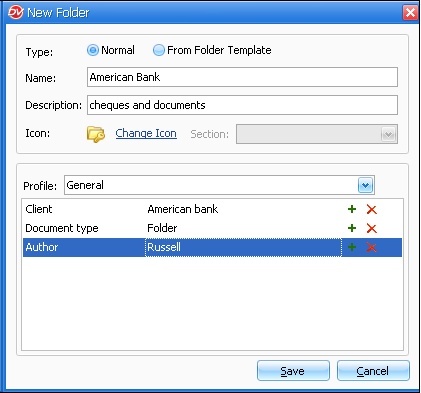 •After providing Folder Name and Description, select the icon of your choice. You can select from preset folders or customize it by adding your own icon to easily classify the folder. •Click on Save button to create a folder..
•Likewise, you can also create sub-folders within this folder. •Users can create a folder in only those cabinets to which he/or she has 'New Folder' rights.